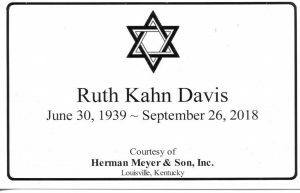 Ruth Kahn Davis, 79 – Herman Meyer and Son, Inc. 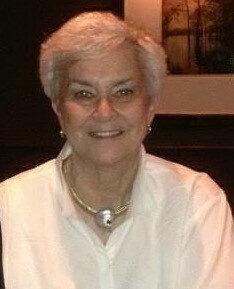 Passed away on Wednesday night, September 26th in Louisville, KY.
Ruth was born June 30, 1939 in Brooklyn, NY. She lived in Belle Harbor, Long Island, NY until she was 14 when her mother, Martha Schiffer Kahn passed away. Ruth and her sister Rita then moved with her father Emanuel Kahn to Louisville, KY when her father was made a director at Brown & Williamson. Ruth was married to the late Joseph Davis of Louisville, KY and they lived in Louisville and Naples, FL. She is survived by her sister Rita Kahn Raus of Louisville, her daughter and son-in-law, Ellen and Aaron Weinstein of Atlanta, GA, her son and daughter-in-law Mark Davis MD and Lauren Harshman Davis MD of Needham, MA, and her grandchildren, Stephanie Weinstein of Atlanta, GA, Mia Weinstein of New York, NY, and Eric and Michael Davis of Needham, MA. Ruth graduated from The Kentucky Home School for Girls in Louisville and Indiana University where she was a member of SDT Sorority. After college she worked as an assistant buyer in retail, but truly felt a calling in the non-profit world. She was on the board of the Auxiliary at Jewish Hospital, a member of NCJW and Hadassah, on the board of Sisterhood at Adath Jeshurun Synagogue, and in most recent years she was on the board at her favorite non-profit, Home of the Innocents. Golf was another passion of hers. Ruth became an avid and champion golfer, enjoying many friendships on the golf course. Ruth was the President of the Fall City District Golf Association and member of the Louisville District Golf Association. Her coach and friends all recount her as a natural. Ruth enjoyed a 55 year marriage, being a mother, and helping others. She will be remembered fondly by those who knew her to have concern, compassion, and empathy for them. Funeral services will be held Sunday, September 30th, at 11:00am at Herman Meyer & Son, Inc., 1338 Ellison Avenue, with visitation beginning at 10:00am. Contributions in Ruth’s memory can be sent to Home of the Innocents or Adath Jeshurun Synagogue in Louisville, KY.